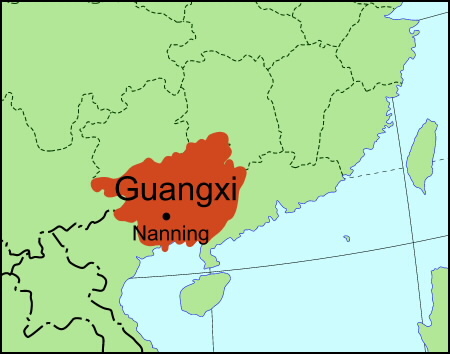 The Chinese have developed a distinctive wooden framing system to support the roof. Tile roofs are very heavy. Rather than bringing all the weight down onto the walls, which is how the triangular truss common in Western construction works, the system developed in China distributes gravitational forces downward and then out through the wooden frame. The weight-bearing frame provides flexibility for the placement of walls, windows, and doors. Non-load-bearing walls can be made of many different materials, such as brick, earth, wood, bamboo, or even corn or cotton stalks. 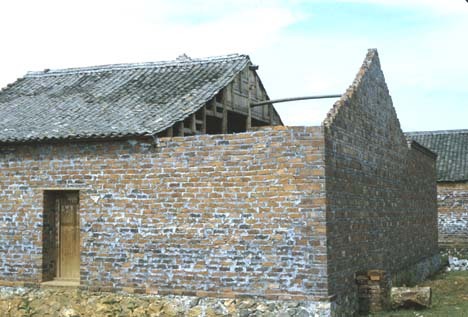 Two main kinds of framing systems developed: pillars-and-beams (tailiang), and pillars-and-transverse-tie-beams (chuandou). Examples of these framing systems can be seen below. 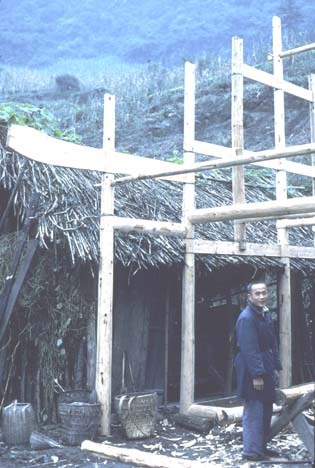 The tailiang framing system is on the left, and the chuandou system is on the right. The main components are vertical pillars that begin at ground level, short vertical supports called purlins, and horizontal beams connecting the purlins. Can you identify these three basic components and determine their function in the diagrams below? Can you describe how either system might be adapted to support curved roofs? What would change to support roofs with pronounced curves? How do you think these types of framing systems are better suited than the Western triangular truss to support a curved roof ? 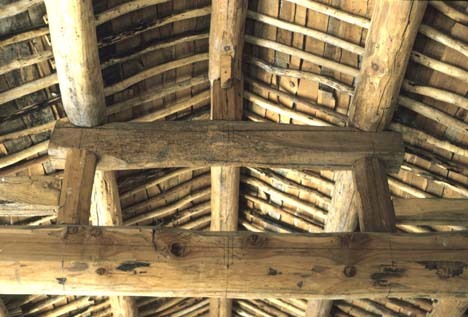 Can you see how the weight is distributed from this photograph of the inside of a roof? Whereas building rammed earth walls required little technical skill, carpenters often needed to be called in to construct the framing system. 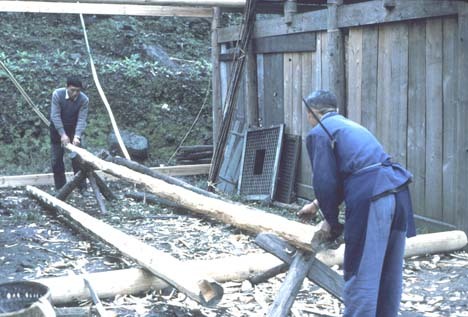 To the left, carpenters in the still relatively well-forested Sichuan province work on a beam for wood framing. A pillars-and-transverse-tie-beams system under construction in Sichuan province is shown to the right. 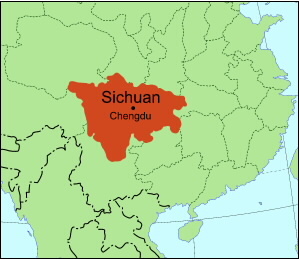 This chuandou system is often used in the south where the houses are deeper. Note the beam that extends past the frame. Why might it be so long and wide? 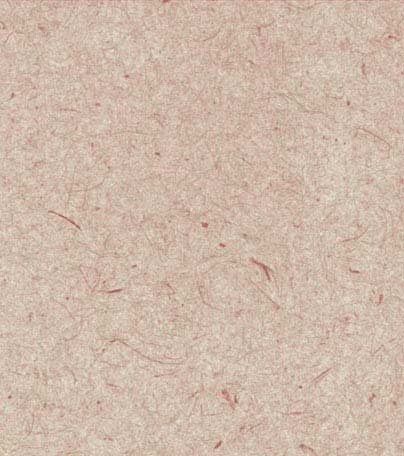 Can you tell what is supporting this roof? 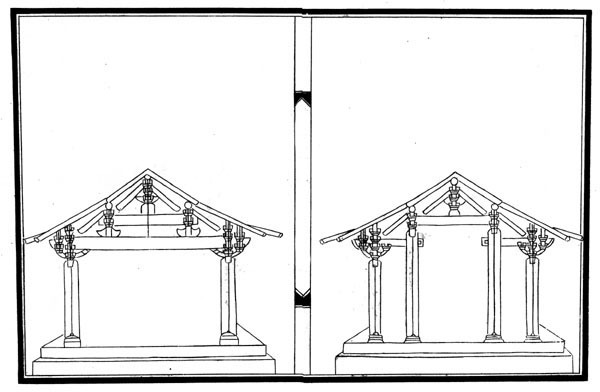 In frames of buildings for wealthier families, or for use in palaces or temples, the function of the cantilevered beam shown two pictures above might be replaced by complex, or corbelled, brackets, shown below. 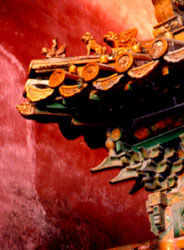 They are the layered green pieces below the eaves. What function do you think the corbelled bracket serves?